What a busy couple of months it’s been. 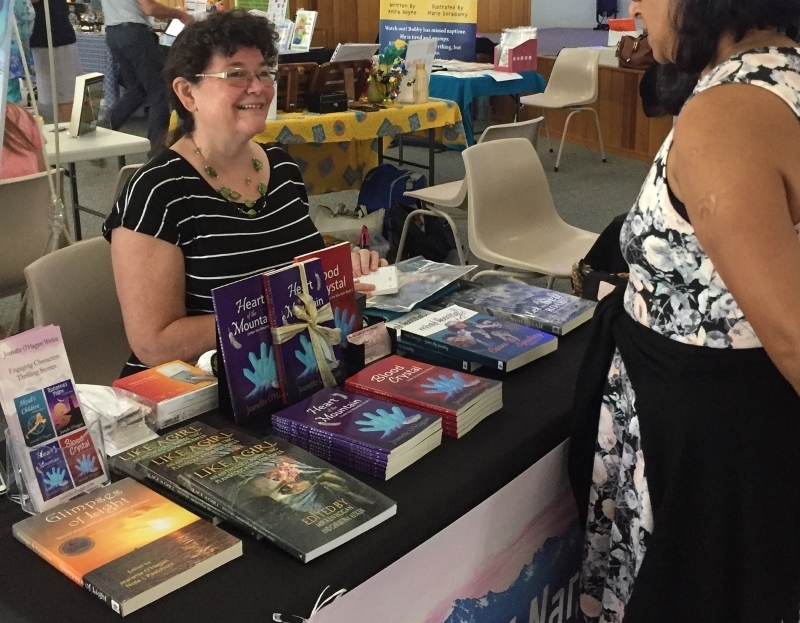 I had a great time at the Omega Writers Book Fair with an exciting range of other authors, workshops and giveaways. Looking forward to the Book Fair next year. 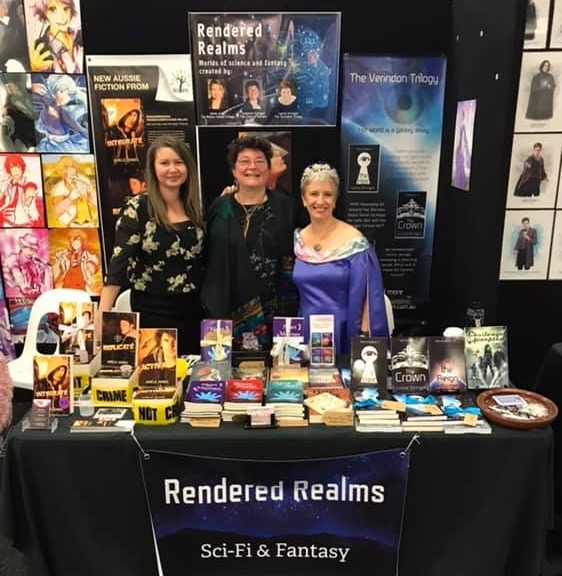 Young Adult Spec Fic authors Lynne Stringer, Adele Jones and I were at Gold Coast Supernova last weekend – under the Rendered Realms banner. Lynne looked particularly dashing in her Verindon Overlord dress and tiara (the Verindon trilogy). I went as Delvina (Under the Mountain series) and also as Kupanna Mara (Akrad’s Children). 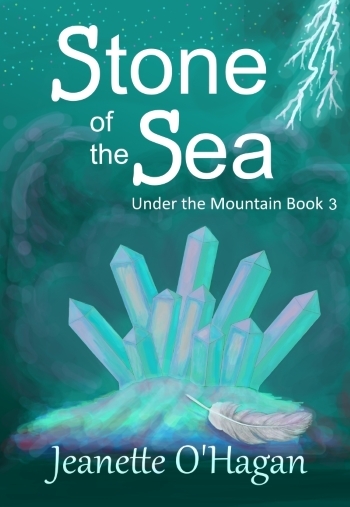 I was excited to have Stone of the Sea the third book in the Under the Mountain series available. I also managed to snag an amethyst crystal that fits in nicely with my Under the Mountain series and hopefully enhances the display. And Lynne had copies of Challenge Accepted available – a charity anthology for the Special Olympics with awesome speculative fiction stories, including one by me, Lynne and Adam Collings. We enjoyed catching up with other authors like Sam Colbran and Naomi Eccles-Smith (Kinseeker series). Naomi did a brilliant commission of Veridnon’s Sara against a Verindon skyline. While Adele was so fired up that she finished up her spin-off story from the Blaine Colton trilogy on site. And, of course, it is wonderful to see all the creative and awesome cosplay over the two days of the convention. We are booked as Rendered Realms at the Oz Comic Con Brisbane in September. So if you’re planning on going, don’t forget to drop in and say hello. The Sparkly Badgers Easter Egg Hunt! I’m participating in the Sparkly Badgers Easters Hunt. The hunt will start on Good Friday, 19th April on Claire Buss’s website. The links will go live on Good Friday. Find the egg on Claire’s website, write down the letter it contains and click the egg to visit the next author. Search for the next egg in the hunt. Once you’ve found all the eggs and collected all the letters, unscramble the anagram and post your entry in the event. (Don’t forget this website). Join the hunt here. Everyone who takes part will win an ebook of their choice from one of our eggtastic authors. 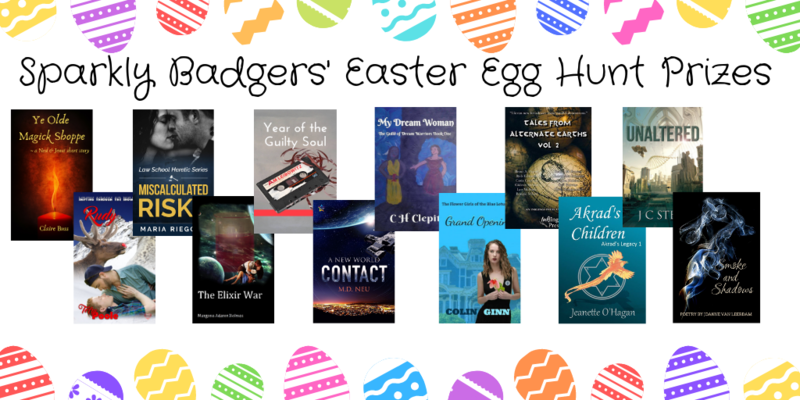 One lucky person will win a chocolate Easter egg and all the ebooks! Good luck and may the eggs be ever in your favour! I’m currently editing Caverns of the Deep, the fifth and final book in the Under the Mountain series. We’re looking at a May/June release. So far, four of my books are available to print – Akrad’s Children (Amazon), Heart of the Mountain, Blood Crystal and Stone of the Sea (Amazon & Ingram Spark). Over the next few weeks, I will be working on the print versions of Ruhanna’s Flight & Other Stories and then Shadow Crystals. Next post – a character interview with Zadeki (from the Under the Mountain series). Wishing you all a lovely and blessed Easter. 2018 was a great year for reading. I smashed my Goodreads Reader’s Challenge goal and just scrapped to finishing the 2018 Popsugar Challenge. Once again this year, my reading included a selection from the classics, big names and several indie authors. While not all are 5 star reads, each of the books chosen for my 15 picks intrigued me and/or left me thinking about the characters, the plot or the world long after I’d put the book down. What were my best spec-fic reads for 2018? This science-fantasy series by Stephen Lawhead consists of five book: The Skin Map, The Bone House, The Spirit Well, The Shadow Lamp, The Fatal Tree. The series follows the adventures of 17th century Arthur Flinders-Petrie, present day Kit Livingston, his erstwhile girl friend Mina, and the villainous Lord Burleigh, as they each seek to explore the mysteries of ley travel between an expanding number of alternative earths. Each transfer to an alternative world is at a different time as well as place – from 17th century London and Prague, to China, to both Middle Kingdom and early twentieth century Egypt, ancient Tuscany, the paleolithic, early twentieth century Jordan, or north American desert. Like the Doctor and Riversong – people can met out of synch with each other which results in some interesting plot points. New characters are added along the way and the stakes grow more serious with each book until it encompasses the whole cosmos. And while the final book didn’t quite live up to the rest, I enjoyed the complexity of the plot, the immersive and detailed nature of each setting, the interplay of the characters, the redemptive arc and transcendence in this brilliant series. Children of the Furnace is a YA dystopia set in a world devastated by global warming, with only the polar regions suitable for human habitation. Will, brought up by his step-father in Sekkerland (Greenland) is sheltered from the realities of the world until he is discovered by the Revouts and sent to Ferule – a re-education camp for boys – as a hated Heater. The book is narrated by both Will and Leah (a girl from the south) with strong world-building and characterisation. Though, at times I found the violence quite harrowing and was disappointed the trope of religious fanaticism, I really did like the originality of setting and that Will seeks another way than ‘the way of the strong’. Here’s my full review. Grounded: A Dragon’s Tale is another book with an original setting that intrigued me. The story inter-leaves the narrative from the dragon Many Colours (aka Rumplewing) in first person with sections from the Watchers (scientific observers) and the enigmatic Baaden in third person. Through Rumplewing, we are introduced to dragon society and to their terraformed planet with a multitude of different wildlife, including unicorns and griffons. Each dragon has a groombug bonded at hatching and cannot live without this lifelong smaller companion. Piper interweaves both personal challenges of young Rumplewing and sixteen year old Hote (one of the Watchers) with grave threats to the existence of the dragons and to the wellbeing of the whole planet, culminating in an exciting showdown. Here is my review. 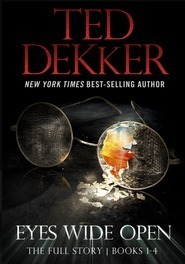 Ted Dekker’s Outlaw series are modern spiritual allegories. Each book is loosely connected to the other but stand on their own merits. I found Eyes Wide Open a gripping read. Christy Snow is trapped in a concrete hollow below the unfinished and supposably empty hospital and has just enough mobile battery to call her friend Austin for help. What follows is a mind-stretching psychological play where neither Christy or Austin knows what is illusion and what is fact, until the appearance of Outlaw. In Hacker, Nyah Parkes is desperate to provide revolutionary brain-restoring therapy for her comatose mother. When she asks her friend Austin for the money, he suggest his experiments with hacking the mind (in order to cure his inoperable brain tumour) provide a better chance of saving her mom. Both Nyah and Austin push the limits, ripping through the envelope of normal reality to find a greater truth beyond the layers. Will they grasp it in time before her mother dies or Nyah’s past mistakes come to destroy them both? I’ve yet to read the second in the series, Water Walker and the origin story, Outlaw, but both the books I have read were gripping psychological thrillers with action and thought-provoking scenarios that kept me turning the pages. My review of Hacker here. Andy Weir’s second book Artemis (following The Martian) is set in the near future on Artemis moon base established by the Kenyan space agency. Jaz (Jasmine Bashara), who grew up on the Moon, makes a living by carrying messages supplemented by some low level smuggling. That is until she is offered a job with an impossible-to-refuse bonus. When things go spectacularly wrong and killers are hunting her down, she has to decide what is worth dying for. This science fiction heist thriller is fast-paced, full of Weir’s trademark maths, with a feisty smart-mouthed heroine. A fun read and I particularly enjoyed the interplay between Jaz and her dad. See my review here. Clara’s Diary is a fast-paced mystery novel in a uniquely steampunk New York setting. It is set in an alternative history, in 1906, in which Octilunes, half-human, half-octopus children of the gods, have emerged from the oceans to live among humans. Detective Joseph (Joe) Desmond is determined to find who murmured his beloved daughter, especially after a look-alike Octilune is also murdered. He investigates both crimes with the help of stunning Octilune shop owner, Sadie, finding himself in danger at every turn. A big clunky at times, it’s a fun read with a world filled with fantastic gismos, memorable characters and a good dash of humour. See my review here. Hunters’ Quest is the second book in Kasper Beaumont’s Hunters of Reloria series. It picks up from where Elven Jewel finishes as a group of hobbits and their halflings, dwarves, an elf, and a knight and a dragon-shifter travel across Reloria to warn the people of the coming invasion of reptilian monsters and gigantic cyclops, to ensure the shields are maintained and to look for a mage to help them rescue the Elven princess Shari-Rose. Hunters’ Quest is a middle-grade to young adult fantasy adventure with a wealth of different fantasy creatures, packed full of action, some romance and humour as well as moments of pathos. It ends on a cliff-hanger leading to A Dragon’s Revenge. My full review here. Guardian of Ajalon is the third and final book of the Joan Campbell’s Poison Path trilogy though it reads well as a stand alone with events of the previous two book introduced as back story. 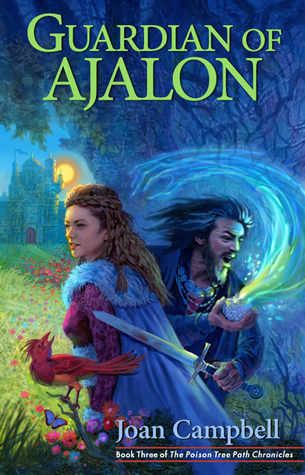 The book follows the adventures and fortunes of Shara’s journey through the dangerous Ri’twine to the fabled kingdom of Ajalon, her friend Nicco’s preparing against attack in the hidden Grotto, and Queen Nya’s decision to go to the aid of the Grotto to save Tirragyl from destruction; each in their way countering the scheming of Lord Lucian and the riftfiends. Intertwined is the story of Prince ‘Eshua, son of Ab’El who enters Tirragyly to save Shara and the people of Tirragyl with clear redemptive analogies. I especially liked the concept of two kingdoms divided by a curse and time-shift, the poison-tree analogy and depictions of Ab’El, ‘Eshua and the Goldbreast. My full review here. I loved Shari Branning’s Quench the Day. Set in a wild west alternative world with shapeshifting, it has the feel of a fairy-tale retelling of star-crossed lovers, Rowen and Aaro, separated and cursed by Aaro’s ruthless cousin, Ormond, and their own inability to see past their anger and grief. Branning conveys both setting and the emotional struggles of the main characters in an evocative, gripping way. This is a book that embodies the saying, don’t judge a book by it’s cover. See my full review here. Inspired to read the book after watching the movie, I enjoyed both. Though there are significant changes between the two (especially the actual quest challenges and how Wayne finds the first key), at it’s essence the movie keeps true to the story. It is both an interesting celebration of 80s culture and the online world, while also critiquing over-immersion in that world and corporate greed that can control it. My full review here. Again, Amazing Grace is book 3 in a series. Set on a huge medical space station (The Nelson Mandela), it is a glorious romp full of humour, larger-than-life characters, a sweet romance and spine-chilling adventure with devastating stakes, some really nasty villains and a high body count. Following the aftermath of previous devastating threats to the station, things soon spin out of control as old threats take on new, deadlier forms. As a new reader to the series, I had no problem catching up with events. If anything, the first third of the book dealt with the aftermath of the previous two books in such depth it slowed the pace a bit, but once the real action started, I was totally hooked. My full review here. Warcross is a YA cyberpunk novel with a feisty young heroine (Emika Chen). After the almost penniless bounty hunter Emika glitches into the Opening Ceremony game of Warcross, its creator, Hideo Tanaka, adds her to the draft as one of the undercover ‘hunters’ tracking down the mysterious Zero. Overall, Warcross was a pleasure to read, with some great worldbuilding (both in the virtual world, the dark net, and future Tokyo), fast-paced (mostly) and intriguing plot. And while the identity and motivations of Zero confirmed my guesses, I still found the finale a strong and satisfying finish with an impossible dilemma and room for a sequel. My full review here. As for the publishing year – not as many books and stories as in 2018, but I did have a few new releases in the world of Nardva. Ruhanna’s Flight and Other Stories is a selection of my short stories, mostly published in anthologies, or on the webpage, a couple unpublished, and one “Before the Wind” I wrote specifically for the collection. I also published Ruhanna’s Flight as a stand alone short story. Stone of the Sea: a novella – the third novella in the Under the Mountain series (following Heart of the Mountain & Blood Crystal) was published at the end of October. 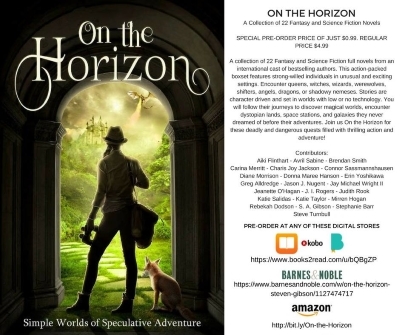 Plus Heart of the Mountain is included in the Book Bundle – Limited Horizon, 12 books of speculative fiction with low technology available for a fantastic price. And for 2019 – once again I’ve taken up the Goodreads Challenge (70 books) and the Popsugar Reading Challenge. 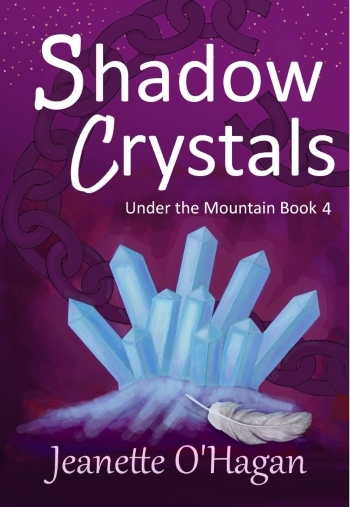 Shadow Crystals, novella 4 in the Under the Mountain series is slated to be published this month (January). With the final novella Caverns of the Deep in a couple of months time. My apologies for the delay in getting Rasel’s Song (sequel to Akrad’s Children) ready. I’m making it a priority to get it released in the first half of this year. Full Moon Rises: a short story will be available released on February 14. What have been your favourite Spec Fic reads in 2017? This year, I’ve enjoyed the 2017 Popsugar Challenge which spurs me on to read a wide range of books. Even so, I’ve managed to squeeze in quite a few Fantasy and Sci-Fiction books and a few movies as well. So which were the ten I enjoyed the best? Marissa’s Meyer four book Lunar Chronicles (Cinder, Scarlet, Cress and Winter) was a fantastic read, so I had high hope for Heartless – the origin story of the Queen of Hearts in Alice in Wonderland. And Meyer didn’t disappoint – Catherine is a wonderful character, as is Jest, the Mad Hatter and others. Meyer does a great job of weaving elements from both Alice in Wonderland and its sequel, Alice Through the Looking Glass. The tale has a lot of whimsy and humour and is compelling – though inevitably, it leads to a sad ending. My full review here. For something entirely different, I managed to see the movie and read the book of this popular sci-fi tale. Told primarily through the stranded astronaut’s journal (with some scenes back on earth inserted), I loved the freshness of the story, the meticulous research in conditions on Mars, the reality of space flight, the logistics and possibilities involved. Weir makes math sound cool – which is awesome. But primarily The Martian was a human story, a story of not giving up and beating the odds. My full review here. The Fated Sky is the first in the Transgressor’s series by E M Swift Hook – when Avilon’s space ship crash lands on the high plateau of a backward and forgotten planet at the rim of the galaxy, he is captured and catapulted into the complicated and often deadly politics of Temsevar. Told through multiple points of view, Swift-Hook does a marvellous job of bringing the planet and the characters to life. An intriguing start to the trilogy. My review is here. Life of Pi includes magical realism – young Pi’s family decides to sell their Zoo and move to Canada. When the ship sinks in the storm, Pi (Piscine Molitor Patel) is trapped on life boat with Richard Parker (a Bengal Tiger), an injured zebra, orangutan, and a hyena. The ensuring struggle for survival is gripping – with moments of desperation, terror and wonder – and a startling twist at the end that leaves you with questions of what is real. My review is here. The Skin Map is the first book in the Bright Empires series. 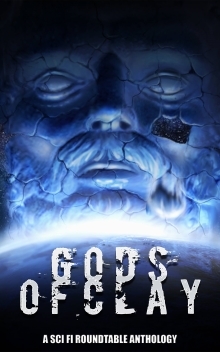 It combines time travel, alternative earths, ley lines, heroes and dastardly villains in a rollicking adventure. Kit Livingstone meets his long lost grand-father Cosmo, and finds himself pulled into the quest to find the skin map and to thwart the villainous Lord Burleigh and his men. The narrative moves around in time and place, with real danger but also recreates Restoration London (1666), 17th century Prague, 18th Macau and ancient Egypt in loving detail. While the pace is at times leisurely, I found the story immersive and enjoyable to read. I’m up for the next in the series, The Bone House. My review is here. Planet Woman looks at human colonisation in a distance planetary system that included sentient planets. When a threat is detected, the Planet Circe sends for an envoy from (non-sentient) First Home. Tethyn Claibrook-Merjolaine is none too pleased when she has to entertain the commanding and arrogant envoy, Lewis Brock, First Peer of the ancient Haute-Forêt family. But larger threats and dangers are in motion. This is the first book in a series and has a number of subplots. Despite some frustrations with the story-telling, it was one of those stories that left me thinking about it long after I’d read it. My review here. D L Richardson’s Welcome to the Apocalypse is a wild ride. Kelly Lawrence, Jack Minnow and Reis Anderson have special tickets to try out the immersive, virtual reality game, The Apocalypse Games, in which players are pitted against one of a range of imagined end-of-earth scenarios – from Zombies, Alien Invasion, Clowns, Global Pandemic and so on. In theory the game lasts for 24 hours, but on this debut run something goes terribly wrong and the players are trapped in apocalypse scenario after apocalypse scenario with no contact with the outside world. What I loved about the book was Richardson managed to keep each scenario fresh and that it was as much (if not more) about the inner battles of the main characters. The ending was a little abrupt – but I look forward to reading the next in the series Welcome to the Apocalypse – Cybernexis (which has been nominated for a Ditmar prize). My review is here. Jewel of the Stars: Earth’s Remnant is Episode 1 of Season 1 of a novella series set in space. 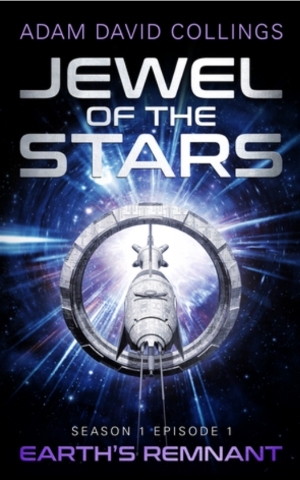 Jewel of the Stars is a cruise liner that travels the stars, until a sudden and catastrophic invasion leaves the ship cut off from the rest of humanity and heading for unknown space to avoid certain death. Collings sets up the story and introduces an number of main characters while delivering on suspense and an exciting finish. I thoroughly enjoyed the read. The only hitch is the wait for the next episode to be published. My review is here. 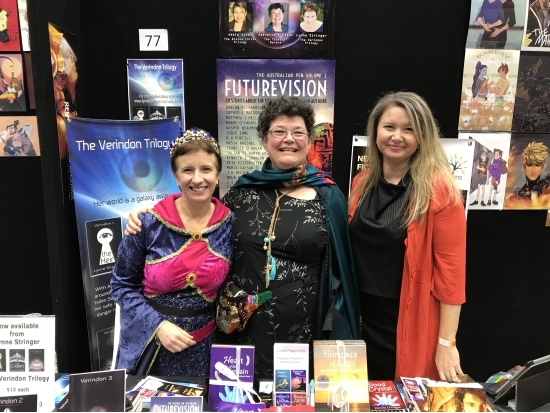 Twenty Aussies authors views of the future – 20 speculative fiction story, Futurevision is a wonderful collation of local talent with a range of stories from science-fiction, fantasy, horror – some full of suspense or adventures, some funny, while most leave you thinking. My own space opera ‘Rendezvous at Alexgaia’ is included. My favourites included Nola Passmore’s ‘One Hundred Words’ (what if all electronic communication was restricted to 100 words? ), Duncan Richardson’s ‘Profile’ (what if our participation in society depends on our digital imprint?) and Sophie L MacDonald’s God and the Machine (what does it mean to be human?) My review here. Another great anthology with talented writers – in this case stories that take place in the dark places under the earth – in caves, caverns, mines, tunnels and cellars. My story is a prequel for the Under the Mountain series (Heart of the Mountain, Blood Crystal, Stone of the Sea, Shadow Crystals) – though is darker more thriller or horror than adventure. I particularly loved Rod Edwards fabulous story of fairy with ‘Lords of Negative Space’, Claire Buss whimsical ‘Underground Scratchings’ with a lovely twist at the end, and the riveting ‘Beasts Above’ by Lawrence Harding. Right at the cusp between old and new year, I finally read Kasper Beaumont’s Elven Jewel – the first in the Hunters of Reloria series. Despite some occasional hitches in style, it was an enjoyable read – with halflings, bond fairies, dwarves, elves, dragons, goblins, trolls, giants, reptilian invaders and rollicking adventures, a touch of romance and a few tear-jerking moments. My full review here. It’s no secret that Star Wars fans are divided about the latest offering. I went to see it with my family on my birthday – and loved it. Okay, not perfect – it had some gross moments and maybe occasionally heavy-handed – but on the whole it keep me glued to screen, and just when I’d think the story was an echo of earlier films, it would subvert or turn it. Some spectacular visual moments, and loved the ending. Interesting finale of Peter Calpaldi’s doctor, teamed up with the first Doctor. It had an interesting theme – as the Doctors struggle with the need to ‘change’ in regeneration. I did like the impromptu Christmas truce in WW1 into the plot, but I felt the story was trying to do too much and so ended up doing less – and not sure what I think about the newly regenerated doctor falling out of the TARDIS. As with each changing of the guard, we will have to see how the new writers and actors take this perennial favourite. My children and I watched Moana just after Christmas with my sister, a niece, two nephews – and loved it. And then watched the DVD on Boxing Day while at my sister’s, and enjoyed it again. Moana and Maui are great characters, with strong character journeys. Visually stunning, incorporating Polynesian culture and myths, and with a great story. Well worth watching a second time. And for me, the other highlight is the stories and poems published – with three poems, eight short stories, one novella (Blood Crystal) and a novel (Akrad’s Children). It’s also great seeing reviews rolling in for Akrad’s Children and Blood Crystal. My plans for 2018 included the sequels to Heart of the Mountain & Blood Crystal, the next book in the Akrad’s Legacy series – Rasel’s Song, a Collection – Ruhanna’s Flight and other stories, plus participating in the On the Horizon Book Bundle (Akrad’s Children will be included with 22 other great stories of speculative adventure). On the Horizon is already available for pre-order. What were your favourite reads – and watches – for 2017? What achievements have you celebrated, what goals do you have for 2018? Wishing you a wonderful Christmas and fantastic New Year. Thanks for all who left comments on the blog tour and those that entered the Blood Crystal Scavenger Hunt. Copper was mined in the Adelaide Hills town of Callington. Trajan’s greatest fear is being underground (though claustrophobia or fear of being trapped would be acceptable). The catacombs are the underground location Nola toured on her trip to Rome. Delvina and Retza go on a perilous journey in Blood Crystal. Mt Morgan mine is associated with pollution on the Dee River. Stalactites are the limestone formations that hang from the roof. The twins final meal as their food ran out on the journey was dried mushrooms and smoked cave fish (with melt water) as mentioned in the excerpt provided. Thanks Sally – your answers were spot on. Great effort Linsey. Loved your detailed answers – and it’s clear you’ve read Blood Crystal – unfortunately though I loved your ‘ground-bat’, this was what the twins ate sometime after their food ran out. All your other answers were correct. I’ll be in contact with you both in the next few days. Reduced Price – for a limited time Blood Crystal is at the reduced price of $99 US. A great time to purchase it. Check it out here. Thanks again for the great support through the launch and blog tour of Blood Crystal. I’m loving the reviews. 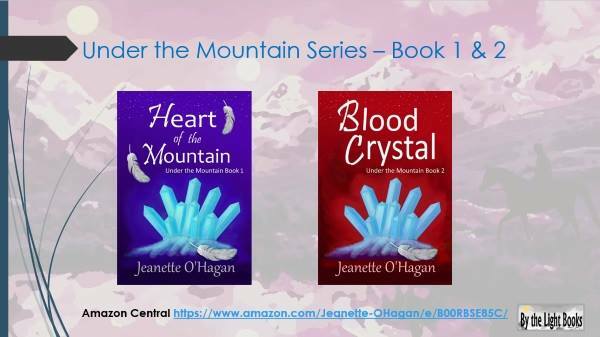 I’m hoping to have both Heart of the Mountain and Blood Crystal available in print by early September. Over the last three weeks, Blood Crystal has been touring a round of fabulous blogs. Today, we arrive at the final stop. Isn’t it strange how, when we are waiting, time seems to stop moving. It’s almost as though we are caught in amber, caught between the moments, as though time itself has been freezed-framed and whatever we are waiting for will never arrive (or is that just me?). The temptation is to give up. And then, in a pivotal instant, there is the knock of the door, the arrival of a friend, the opportunity we’d hoped for. As a writer, we want it all to happen from finishing writing the book, to publishing it, to gaining thousands of readers – but at each step of the journey we find ourselves waiting and in need of patience and persistence. At one point in the Blood Crystal, the twins Delvina and Retza head off on a treacherous journey to find help from Zadeki and his kin. They face a number of different challenges due the extreme terrain and their own unfamiliarity with the ‘outside’. At one point they run out of food and it seems they will never reach their goal. Delvina placed the last of their dried mushroom and slithers of smoked cave fish into Retza’s mug and poured some of the steaming melt water over it. Saliva flooded her mouth at the tantalising smell. She offered the mug to her twin, giving him her own share in mute apology. If there was a source of food in the barren wilderness, neither she nor Retza had been able to find it. He gulped down the broth and then thrust the cup into her hands, half full. Once she swallowed the delicious mouthful, she stood and gathered her gear. Retza groaned and did the same. Ducking her head, she stepped out into the soft grey light that seemed to linger as the sun dipped down behind the jagged skyline. Retza stumped in front of her and took the lead and the full force of the buffeting wind for this shift. She clutched the copy of the instructions the old Scrybe had written out for her. A soft sorrow welled up and brought tears to her eyes. It was hopeless, beyond crazy. Perhaps they should go back. Is their patience and persistence rewarded? You’ll have to read Blood Crystal to find out. Last question for the Scavenger Hunt. What is Delvina and Retza’s final meal as their food runs out during their journey? Blood Crystal Scavenger Hunt will run throughout the Blood Crystal Blog Tour. Each blog will have a reflection or memory related to themes within Blood Crystal and a related question. The first person to answer all NINE questions right will win a $50 Amazon voucher. The runner up will receive copies of both Heart of the Mountain and the sequel Blood Crystal. Please give your answers in the comments below. Here are the Questions with links to the different blogs to find the clues. Blog 1 Jeanette O’Hagan Writes: Where do Glow Worms live and what kind of animal are they? Blog 2 The Vince Review: What mineral used to be mined in the Adelaide Hills town of Callington? Blog 3 Lynne Stringer: What do the agents need more than Sarah? 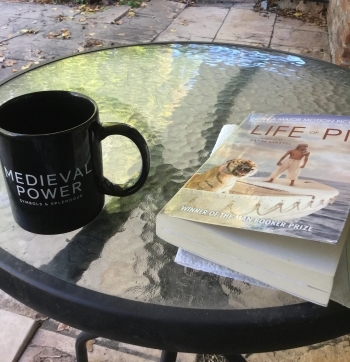 Blog 4 Cindy Tomamichel: What is Trajan’s secret fear? Blog 5 The Write Flourish: What is the name of that underground location which Nola toured? Blog 6 David Rawlings Author: Who has to go on a perilous journey in Blood Crystal? Blog 8 Adam Collings: The formations that hang down from the ceiling of a cave, are they stalactites, or stalagmites? Blog 9 Jeanette O’Hagan Writes (here): What is Delvina and Retza’s final meal as their food runs out during their journey? I’m looking forward to seeing your answers. Announcing the winners who commented on the different stops on the way. Thank you for everyone who took time to stop by, read and leave a comment. I loved reading through the different comments and found it hard to choose. One person deserves a grand-prize as she give thoughtful and interesting answers on every single blog. Way to go Nola Passmore. So without more ado, I’ll detail the winners of a copy of Heart of the Mountain. (If you’ve already have a copy, you can nominate a friend to receive a copy or nominate one of my other e-books instead – The Herbalist’s Daughter, Lakwi’s Lament or Blood Crystal). Blog stop 1 – this was so hard to choose, but I loved Susan Preston’s answer. Blog stop 8 – some great answers & hard to choose, but as others have already received a prize, Christine Dillon (also receives a copy of Lynessa’s Curse by Adam Collings). I’ll announce the Scavenger Hunt winners next Friday – so you still time to enter, but remember the first two to get the all the correct answers wins. Superheroes are all the rage on the big screen. Super-heroes have super powers, snazzy suits, impressive physiques and side-kicks. They laugh in the face of danger, amaze us all with their stunts and tricks, and despite the super-villains they are pitted against, they always save the world – or the cosmos. Do you remember Susan Boyle when she first walked on the stage. No one took her seriously, no one thought she could sing – until she opened her mouth and the world gaped. Often we are so fixated on image that we miss the substance. In real life – heroes come in all shapes and sizes. They don’t necessarily have perfect figures, flawless hairdos and the latest fashion sense or the coolest technology. The twins, Delvina and Retza, may not look like your typical heroes – but I think they are. In Blood Crystal, they undertake an epic journey across a hostile landscape to save their realm. They dare to attempt what others are too afraid to, they have the grit to keep going and faith that they will find answers. They care what happens to each other and the people they know. Can you think of some unlikely heroes? What do you admire about them? What can you learn from them? The underground realm is under attack from mad Overseer Uzza and the Crystal Heart is failing. As things become desperate, Twins Delvina and Retza must brave a treacherous journey to seek help from Zadeki and his people. Will they find the answers they seek before it’s too late? Is the blood of Uzza’s children the only way to restore the Crystal Heart? What are the twins prepared to do to save their realm and those they love from certain destruction? Blood Crystal is the second novella in the Under the Mountain series. Like most of my fiction, it is set in the world of Nardva. Available from Amazon, or Kobo, Nook and other retailers. A few days ago, we launched Blood Crystal – sequel to Heart of the Mountain. 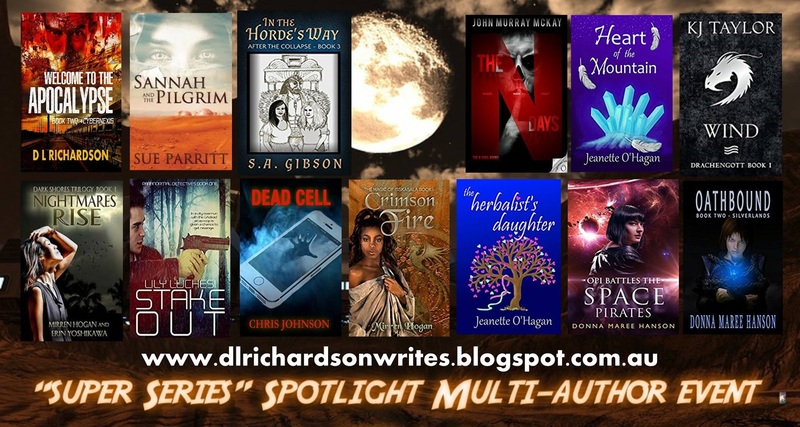 Over the next couple of weeks – Blood Crystal will be featured on a different blogs as part of the Blood Crystal blog tour. Throughout the blog tour there will be many opportunities to win prizes. 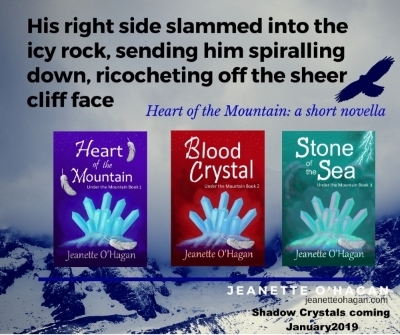 Comment below on this post (and on any of the posts in the Blood Crystal Blog Tour) – the best comment (imo) will win a copy of Heart of the Mountain: a short novella. Blood Crystal Scavenger Hunt will run throughout the Blood Crystal Blog Tour. Each blog will have a reflection or memory related to themes within Blood Crystal – and a related question. The first person to answer all NINE questions right will win a $50 Amazon voucher. The runner up will receive copies of both Heart of the Mountain and the sequel Blood Crystal. Follow each post on the blog tour to find the questions & list your answers in the comments on the final blog post of the tour on 28 July. There will also opportunities to win prizes at each blogspot. In my twenties I stayed at Lune River Youth Hostel south-west of Hobart. Apart from a pet possum that would scamper up guests’ legs to reach their heads, the Youth Hostel was close to some famous glow worm caves (in the Hastings caves area). Getting to the caves involved driving into the bush on dusk, stopping at the side of the road as the sun set behind the horizon and them hiking in 20 minutes to an abandoned site, using old railway lines as a guide for part of the way. As the light faded, we secured our miners lamps and jumped down to a creek (or small stream) and followed it as it disappeared under the hill into the spacious caverns. We walked some distance in, staying in the main cave, and switched off our lights. Slowly above us the cave roof filled with bright stars in swirls and clusters denser than the milky way in the middle of the outback – glowing lights produced by a colony of insect larvae. Did you know that glow worms only found in Australia and New Zealand? After we had enjoyed the wonder and beauty of their magical lights, we clambered out from under the mountain, up from the creek bed and walked back through the bush to the road in the dark. Glow worms are small, seemingly insignificant – yet produce inspiring beauty as they shine in the dark – perhaps unlikely heroes. It was an amazing experience, one which I drew, on along with a visit to the deep underground mines in Mt Isa, when writing Heart of the Mountain and Blood Crystal. Where do Glow Worms live – and what kind of animal are they? The next stop on the blog tour – is Paula Vince. She will be giving her review of Blood Crystal If you haven’t discovered it yet. Paul gives thoughtful, entertaining and intriguing reviews – including a fresh look at our favourite books through lists – in the Vince Review. Check it out here. Narnia, Harry Potter, The Hunger Games, The Inheritance Cycle, The Lunar Chronicles, Game of Thrones …. Well, I know I do. There is something immersive in a series. 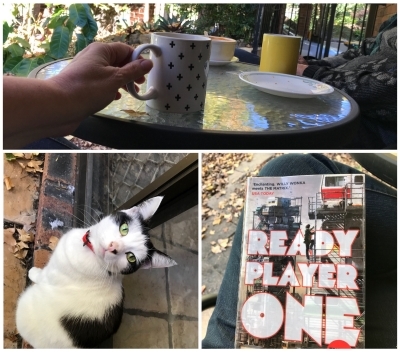 It allows the reader to stay in the world longer, savour it’s unique flavour, to get to know its cast of characters, to feel like you belong. This June a number of authors have banded together to offer an introduction to exciting speculative fiction series. D L Richardson’s Welcome to the Apocalypse, Mirren Hogan’s The Magic of Isskasala series and other great spec fic titles. 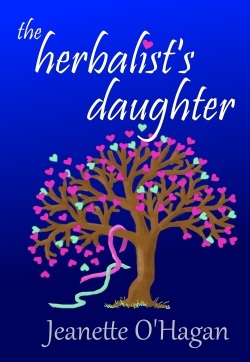 The Herbalist’s Daughter, story 1 in Tamrin Tales. A YA fantasy romance story set in the Golden Palace of Tarka some years before the start of the Akrad’s Legacy series. Anna has her heart set on the young guard at the Palace but he seems not to notice her until her young charge stirs up trouble. Download from here . 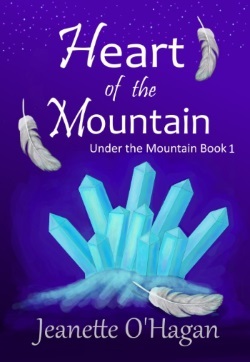 Heart of the Mountain: a short novella – book one in the Under the Mountain series. Twins Delvina and Retza’s greatest desire is to be accepted as Prentices by their parents’ old crew when they stumble across a stranger, Zadeki. 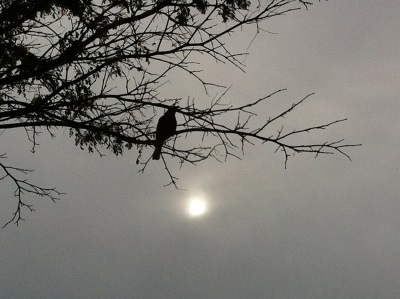 Soon the glimmer lights begin to fail. Will the three youngwuns work together to save the underground realm? Download from Amazon here or here. And now presenting – the sequel to Heart of the Mountain, Blood Crystal is due to be released at the end of this month. 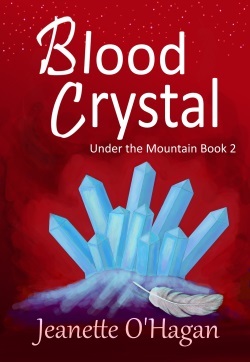 Blood Crystal is the second novella in the Under the Mountain series. Like most of my fiction, it is set in the world of Nardva. Available from Amazon, Kobo, Nook and other retailers from 30th June 2017. 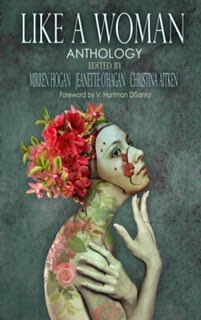 I’m also thrilled to announce the cover reveal of Like a Woman anthology – a speculative fiction anthology with profits donated to survivors of domestic abuse. Like a Woman follows on from Like a Girl anthology which supported girl’s education. Both have covers by the talented Drusilla Morgan. The anthology is still open for submissions and should be published later this year or early 2018.